Philippine president Ferdinand Marcos began his career in politics with the murder of Julio Nalundasan in 1935, and ended it after the murder of Benigno Aquino Jr. in 1983. Some believe his entire life was based on fraud, deceit, and theft, and his time as president has come to represent one of the prime examples of a corrupt government. Ferdinand Edralin Marcos was born on September 11, 1917, in Sarrat, a village in the Ilocos North region of the island of Luzon in the Philippines. His parents, Josefa Edralin and Mariano Marcos, were both teachers from important families. In 1925 Mariano Marcos became a congressman, surrounding the young Ferdinand in a political atmosphere at an early age. Mariano also had a strong influence on what was to become Ferdinand's competitive, win-at-all-costs nature. Mariano and Josefa pushed Ferdinand to excel at everything, not only his studies at school, but also at activities such as wrestling, boxing, hunting, survival skills, and marks-manship (skill with a gun or rifle). In college, Marcos's main interest was the .22-caliber college pistol team. Marcos's real father was not Mariano but a wealthy Chinese man named Ferdinand Chua. (Marcos would claim that Chua was his "godfather.") Chua was a well-connected judge who was responsible for much of Marcos's unusual good luck as a young man. Among other things, Chua paid for young Marcos's schooling and later managed to influence the Philippine Supreme Court to overturn the young Marcos's conviction for murder. On September 20, 1935, Julio Nalundasan was at home celebrating his congressional election victory over Mariano Marcos when he was shot and killed with a .22-caliber bullet fired by the eighteen-year-old Ferdinand Marcos. Three years later, Ferdinand was arrested for Nalundasan's murder. A year later, after having graduated from law school, he was found guilty of the crime. While in jail Marcos spent six months writing his own appeal for a new trial. When the Supreme Court finally took up Marcos's appeal in 1940, the judge in charge (apparently influenced by Judge Chua) threw out the case. Marcos was a free man. The next day, he returned to the Supreme Court and took the oath to become a lawyer. World War II, the Philippines were invaded and occupied by the Japanese, while U.S. forces and Filipino resistance fighters fought to regain control of the country. Marcos emerged from World War II with a reputation as the greatest Filipino resistance leader of the war and the most decorated soldier in the U.S. armed forces. However, he appeared to have spent the war on both sides, lending support to both the Japanese and the United States. In early 1943 in Manila (the capital of the Philippines), Marcos created a "secret" resistance organization called Ang Mga Maharlika that he claimed consisted of agents working against the Japanese. In fact, the group consisted of many criminals—forgers, pickpockets, gunmen, and gangsters—hoping to make money in the wartime climate. At the war's end, Marcos took up the practice of law again. He often filed false claims in Washington, D.C., on behalf of Filipino veterans seeking back pay (wages owed) and benefits. Encouraged by his success with these claims, he filed a $595 thousand claim on his own behalf, stating that the U.S. Army had taken over two thousand head of cattle from Mariano Marcos's ranch. In fact, this ranch never existed, which made Washington conclude that the cattle never existed. In December 1948 a magazine editor published four articles on Marcos's war experiences, causing Marcos's reputation to grow. In 1949, campaigning on promises to get veterans' benefits for two million Filipinos, Marcos ran as a Liberal Party candidate for a seat in the Philippine House of Representatives. He won with 70 percent of the vote. In less than a year he was worth a million dollars, mostly because of his American tobacco subsidies (financial assistance to grow tobacco), a huge cigarette smuggling operation, and his practice of pressuring Chinese businesses to cooperate with him. In 1954 he formally met Imelda Romualdez (1929–) and married her. 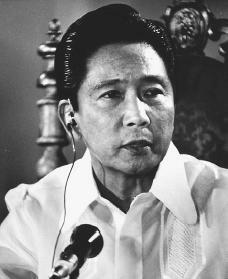 Marcos was reelected twice, and in 1959 he was elected to the Philippine Senate. He was also the Liberal Party's vice-president from 1954 to 1961, when he successfully managed Diosdado Macapagal's (1911–1997) run for the Philippine presidency. As part of his arrangement with Marcos, Macapagal was supposed to step aside after one term to allow Marcos to run for the presidency. When Macapagal did not do this, Marcos joined the opposition Nationalist Party and became their candidate in the 1965 election against Macapagal and easily won. Marcos was now president of the Philippines. In 1969 Marcos became the first Philippine president to win a second term. However, not all Filipinos were happy with his presidency, and the month following his reelection included the most violent public demonstrations in the history of the country. Three years later, facing growing student protest and a crumbling economy, Marcos declared martial law, a state of emergency in which military authorities are given extraordinary powers to maintain order. Marcos's excuse for declaring martial law was the growing revolutionary movement of the Communist New People's Army, which opposed his government. During the next nine years of martial law, Marcos tripled the armed forces to some two hundred thousand troops, guaranteeing his grip on government. When martial law was lifted in 1981, he kept all the power he had been granted under martial law to himself. Meanwhile the economy continued to crumble while Ferdinand and Imelda Marcos became one of the richest couples in the world. As Marcos's health began to fail and U.S. support for him lessened, opposition to Marcos grew in the Philippine middle class. The Marcos regime began to collapse after the August 1983 assassination (political killing) of Benigno S. Aquino Jr. (1933–1983), who had been Marcos's main political rival. Aquino was shot and killed when he arrived at the Manila airport after three years in the United States. The killing enraged Filipinos, as did authorities' claim that the murder was the work of a single gunman. A year later, a civilian investigation brought charges against a number of soldiers and government officials, but in 1985 none of them were found guilty. Nevertheless, most Filipinos believe that Marcos was involved in Aquino's killing. Marcos next called for a "snap [sudden] election" to be held early in 1986. In that election, which was marked by violence and charges of fraud, Marcos's opponent was Aquino's widow, Corazon Aquino. When the Philippine National Assembly announced that Marcos was the winner, a rebellion in the Philippine military, supported by hundreds of thousands of Filipinos marching in the streets, forced Ferdinand and Imelda Marcos to flee the country. Marcos asked for U.S. aid but was given nothing more than an air force jet, which flew him and Imelda to Hawaii. He remained there until his death on September 28, 1989. The Marcoses had taken with them more than twenty-eight million cash in Philippine currency. President Aquino's administration said this was only a small part of the Marcoses' illegally gained wealth. Bonner, Raymond. Waltzing with a Dictator: The Marcoses and the Making of American Policy. New York: Vintage Books, 1988. Celoza, Albert F. Ferdinand Marcos and the Philippines: The Political Economy of Authoritarianism. Westport, CT: Praeger, 1997. Romulo, Beth Day. Inside the Palace: The Rise and Fall of Ferdinand & Imelda Marcos. New York: Putnam, 1987. Spence, Hartzell. For Every Tear a Victory: The Story of Ferdinand E. Marcos New York: McGraw-Hill, 1964. Be fair when writing your article about Marcoses. Why we always accused Pres. Ferdinand E. Marcos as a dictatorial, corrupt, fraud, deceit, theft, etcetera, etcetera, etcetera..and Benigno Aquino as a hero! Why! He done nothing in our Motherland..just to say something..about Marcos..exposing Marcos of what basis? You people always taking, writing, accusing the dead man..and so the issues are useless..
Why we never write all his accomplishment..and accepting all this accomplishment that he does. my father served as a personal commanding officer for 17 years in Marcos' presidency. Like your view mine is biased too. all I saw was the good that he brought to my family and my country. Due to many negative claims that people have against his late ex- president i refuse to affirm my identity. Yet one reason my father retired the Philippine Army was because he could not stomach to salute to the following president Aquino. Even though he could have continued to become a General he retired as a Colonel. Marcos brought culture into the country and made the world know about the Republic of the Philippines. Imelda had many shoes, but brought culture and let the beauty of the philippines bloom. He is but human and did what he thought was good for his country. the Philippine elite had little need to maintain democratic appearances. Fake war hero Ferdinand Marcos was elected in 1965, declared marshall law in 1972, and then defrauded his countrymen and partied his way into the hearts of U.S. celebrities for the next 14 years. Also included are several chapters on "Yamashita's Gold" -- the apparent source of much of Marcos' wealth. There's still $100 billion or so that hasn't been recovered, which attracted treasure-hunters such as the John Birch Society and, as recently as 1986, John Singlaub, who wanted the gold to fund his anti-communist campaigns. Your article, like so many anti-Marcos articles written by persons who are brazenly and rabidly against the former President, makes one wonder. For one thing, if my uncle who fought with Marcos in Bataan were alive today, he would have told you that he personally witnessed the injury sustained by Marcos and that he was the one holding the flashlight while Marcos was operated on right there at the battlefield. So you wont think that this is made up, another soldier, who later became General, was with them. His name was Gen. Alejo Santos, a name known to many Filipinos particularly from Bulacan. So to say that Marcos' wartime exploits were fabrications is to insult not only him but the many gallant Filipinos who fought alongside him in Bataan. Going to the Marcos administration, you make it sound like the man did not accomplish anything at all. Many Filipinos are enjoying the benefits of the Philippine Heart Center, the Light Rail Transit, Kidney Center, Philippine General Hospital, North and South Expressways, Coastal Road, and so many other infrastructures that even the latter day politicians are trying to get credit for the things Marcos started. With regard to the Bataan nuclear power plant, do you think we would have the power crisis of the 1990s if its operation was not stopped by the Aquino administration? And, look. Corazon Aquino had six years to look into the killing of her husband Benigno. She had all the legal and political backing, or so she said. She could have brought all the facts into the open, once and for all. Why didnt she? So please look deeper and closer into the events and personalities before you disparage everything about Marcos.Its not as simple as writing critical statements without looking into the background. Im sure he was a better man than many of those in government now are, nor can they expect to approximate his achievements. This is truly a biased article. We know better than this and though I may not able to witness the time of Pres. Marcos but from what he has done to our country is enough to prove that he is truly a good man! People always remember only the bad things he did and never really realize all those good things he brought to this country. As what our law or constitution say that we can never condemn someone or accused as criminal unless proven guilty. Mrs. Marcos had more than 9 thousand case filed against her but all were dismissed. Why? because they cannot prove they are guilty with all those accusation they pointed out. Don't let the truth be twisted with just some emotions or sympathy with someone else. Truth would really hurt big time but that will make a difference in this country! We shouldn't compromise but let the real democracy be practiced so that the new generation will never get their mind twisted from the truth. Since I was in highschool and that was like 12 years ago, I keep looking for a book that tells me fairly about the time of Pres. Marcos. Hopefully her daughter will write the story of his legacy. i agree with Chris Odchigue. Though i'm from ilocos norte where Marcos came from, that means im one of his loyalist, an article like this was never a good one because it's just shows that the writer is an anti marcos. Yes, we have our own ideas on whatever history we have, but it is not right to degrade the marcoses. We known marcos for fraud, corruption, but the philippines during his time was the tiger of asia.# 1 in Asia and I guess #7 in continental. Lots of infrastructure, the ccp complex, ICCP, lung center, heart center, mrt, lrt, NLEX, SLEX, Bataan nuclear plant, gethermal plant, san juanico bridge, a lot..he's te only president who can do this. No one can beat marcos..
Pres. Marcos was an iron man. A country full of corrupt politicians and undisciplined people needs one. He was neither perfect, but he made a lot of good deeds that today's Filipinos are still benefiting. My grandfather, a small-time farmer adored him for making and implementing laws that favored the poor peasants in his time. There are more to learn about Pres. Marcos and the more you get to know them, the more you get awed. Ninoy Aquino would have declared martial law also because he too believed that due to the "cacique" culture which the oligarchs espoused, a strong and authoritarian type of leadership would be capable of utilizing disciplinarian methods and so enforce order within the Philippines! The oligarchs since the before the arrival of the European colonists have always influenced the culture in the islands wherein their control was dependent on dividing those 'under' them who were forced to choose sides as is evident in feudal societies!! So chaos and divisive tendencies were the norm because just as you divide then conquer after the conquest the fragmentation must continue to prevent any form of unified rebellion!!! Grand visions like '... a new society or bagong lipunan' fall prey to the allure that joining the ranks of the oligarchy and so attaining a higher status hence corrupting the visionary! Bottom line is this. His legacy is failed leadership. John Adams said, there are two ways to enslave a nation, one by sword and the other by debt. Fact is, his massive accumulation of debt during his reign and the unwise use and stealing of these funds buried the country to this day. I'm sure he had good intentions and did some good but it was overshadowed by the disastrous outcome of his tenure as the president. President Marcos alone is accountable for the success or failure of his leadership. And the fact is, he failed. And the failed policies continued to this day that further enslave & burden the great Filipino people. The Philippines should have long defaulted on this odious Marcos debt like what Brazil, Mexico, Argentina ( paid 30 cents to the dollar with the bond holders), etc., did to their debts by renegotiating the loans. The country continue to be burdened by the ever-growing debt that the succeeding presidents followed through. A vicious cycle indeed that is breaking the current & coming Filipino generations. This is the fact supported by data. Calling him a hero was not a disgrace to our ideology, but a fact was been written, and that prouves that the Philippine law and constitution was to young and need to be revised so to condemn that a persona like him will not be elect again. He had done many but it was all just a coverage from all of what he had taken from the Filipino people. No matter how bad he was he deserve our respect, like those others who had done wrong in their life. This article is garbage! Marcos may not be perfect but he is a legend. He is incomparable. No president after him had the same brilliant vision for the Philippines. The Marcoses have been acquitted on all cases filed against them but some people are still blind and deaf due to the PAID media spreading lies. Black propaganda was created only by the vengeful Cojuangcos and Aquinos who are too greedy for power. After 30 years... now what??? Philippines is still going down the drain. Such a twisted democracy. I am a firm believer that only the Marcoses could help the Philippines rise again as their compassion for the country is evident! President Ferdinand Edralin Marcos is the Philippine's best President. He is beyond compare with the rest of the Philippine Presidents especially the Aquinos who have not done anything good for the country. Just be reminded of the Luisita Massacre which was one of the most brutal incident during the Cory Aquino's reign. Please be fair when you try to write something about President Marcos. It hurts most Filipinos who love him and his family. Its okey to write the truth but be sure to have a strong evidence in what you are writing.. Thank you. the Aquinos were in power for 12 years, how come they were not able to investigate what really happened to Ninoy and who is responsible for his death. There are some rumors about he was dying and his death was orchestrated to oust Pres. Marcos by his own relatives??? was this the real reason why the truth has not surfaced. Hopefully, history will reveal itself. As the saying goes "You can not hide the truth forever" & "The truth will always prevail". Hope it comes soon for the public information.